We Are At War - Bill speaks on the reality that we have an enemy who is out to kill, steal and destroy, but that God has prepared us, equipped us and is leading us continually into the victory that Jesus has already won on calvary. 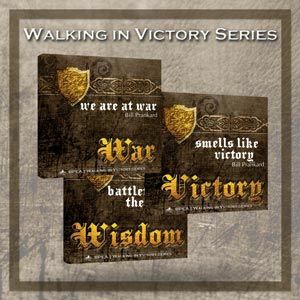 Smells Like Victory - The world looks at things one way, but as Christians we have been given the mind of Christ and are able to see through our spiritual eyes the reality that Jesus Christ is King, ruling and reigning and not only is He aware that the world seems to be in crisis, but he is working his plan, and that plan involves YOU! Battlefield of the Mind - If the enemy can get you hung up in your thought life you won't be able to get past your mind and step out in faith into what God has planned for you. Bill preaches a powerful message on overcoming the destructive thoughts that would try to hold us down, taking on the mind of Christ and living a life of freedom.